Since that time, both the hardware and software have been significantly updated. 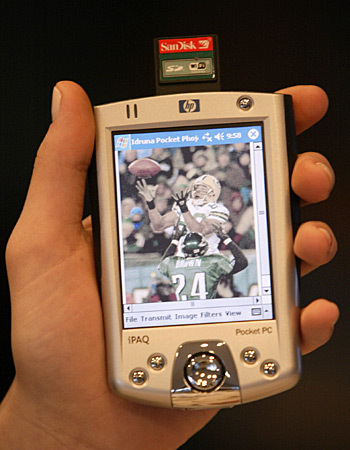 The earlier HP Ipaq units required a piggyback adapter to use compact flash, making the combination somewhat bulky and expensive. I'm now using an Ipaq 2215 (same as the 2210), which has both a CompactFlash and Secure Digital slot built in. It is small, light, and uses the new Windows Mobile (Pocket PC) 2003 operation system. It's very very cool, and lists for $399. You can find it for $349 if you shop carefully. (I've outfitted it with a Bluetooth GPS, mapping software, an SD Wi-Fi card, and it rocks! Placed on my dash, it directs me to any location vocally, just like the "Hertz Never Lost" or built in auto GPS devices. My thanks to Mike Blake for the idea!) And it's also an MP3 player! But the coolest part is the updated Pocket Phojo software? It is easier and faster than ever. The image processing has been redesigned in version 2.5 to allow for almost instantaneous loading of large thumbnails from the CF card. After browsing and selecting a photo to edit, the loading of a high-res image now takes only a few seconds, 50% faster than before. All the usual editing functions are now available, cropping, rotating, resizing, levels, curves, burn and dodge, unsharp mask … all visible at once. Full IPTC captioning, with saved templates, allows for very rapid on-the-fly captioning of an image for transmission. Built in FTP and email, tied into the IPAQ's address book, complete the workflow and all work seamlessly. I can send photos from within Phojo either via the Wi-Fi card if service is available or via my Sprint cell phone connected to a cell phone. There are dozens of new features in the new version, including handling of large files from cameras such as the Canon 1DS and Kodak 14N, playing of WAV files, and folder watching and transfer of files over Wi-Fi from the new Nikon D2H Wi-Fi adapter. See Idruna's web page for complete details of all the updates. I'll still edit major sports events and other shoots on my laptop, since a 15 inch screen and full keyboard will always beat a pocket pc, but I now can travel about with the Ipaq and Phojo and know that I can send from anywhere at anytime without carrying a backpack full or gear. And there are times where in the past I've had to leave a baseball or basketball game in the 1st half to make an early deadline, missing key action. Now I can send a quick photo or two from my seat without missing anything. The bottom line is that the combination of the new faster, cheaper Ipaq with built in CF and SD slots and the supercharged Phojo software has made this an editing and transmitting tool that is well worth having for a mobile photographer needing to send files in a hurry from remote locations. The CEO of Idruna is Paul Nolan, who is remarkably helpful in answering questions, resolving issues, and quickly making changes to accommodate needs. Pocket Phojo lists for $489, but there is a discount available for Sports Shooter readers and … contact paul@idruna.com for info.